The wine route is one of the most beautiful excursions in France and Europe. It is a road that crosses Alsace, cities, villages and of course vineyards. This road is part of the culture of Alsace and are at the center of cultural and tourist life. Each year, thousands of amateurs, tourists or simply curious walk these paths to discover the heart of Alsace. Your Private Chauffeur VTC will have the pleasure of making you discover this heritage. Our company is expert in luxury tourist support. We provide you with a quality service based on solid training and real field expertise. Our drivers are VTC graduates with personal protection training. Our knowledge of Strasbourg and its surroundings, as well as the invaluable tourist heritage of the Alsace region are a real asset that will make you enjoy local resources. The Alsace region and its surroundings abound with tourist sites, and it is known for the excellence of its wine and the richness of its gastronomy. We invite you to discover its colors and flavors. 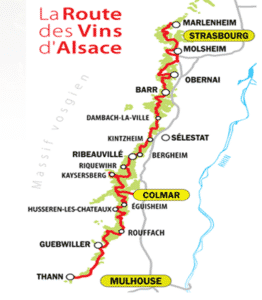 The Alsace wine route is the oldest wine route in France. It was inaugurated in 1953 and extends over 170 kilometers and 73 communes, across the departments of Haut-Rhin and Bas-Rhin. Its symbol is white wine. It is a must for anyone wishing to discover Alsace. While browsing this site, you will discover the history of the villages that are all along this route. We invite you to discover these places and have a good time with family or friends. The most famous Route de France: the French Wine Route, proudly deploys its medieval castles, its Renaissance style houses, its flowery alleys of its villages with so much Alsatian charm. Alsace is a land of traditions and wines. It offers the visitor a rich and unique experience. 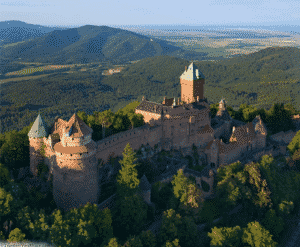 We also invite you to discover Mont Saint Odile and the Haut Koenigsbourg castle between Strasbourg and Colmar. Haut-kœnigsbourg is a castle dating back to medieval times in the town of Orschwiller (Bas-Rhin). The origin of this name comes from the German Hochkönigsburg meaning “High Castle of the King”, which has been Frenchized. 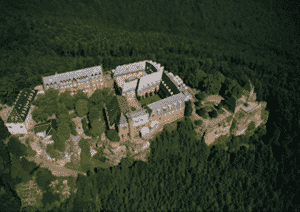 Finally, above the mountains and forests of the Vosges is the Saint Odile Monastery founded in 700 after J-C. Saint Odile is the patron saint of Alsace. It is nowadays a very popular place of pilgrimage and visit for the tourists and the surrounding population who likes to relax in these places. Come discover the Wine Route in Alsace! Your Private Chauffeur VTC in Alsace will accompany you in these beautiful places to make you discover the beauty and heritage of the region. You want to discover! Contact us!